Fr Marian Nycz, popularly known as Father Mario, was appointed on 4th December 2015 as Parochial Administrator for St Patrick’s Parish, Chislehurst. Originally from Poland, Father Mario has worked for many years in education. His natural gift for adapting to a new environment has enabled him to take over as Parochial Administrator of St Patrick’s following Father George Webster’s retirement. 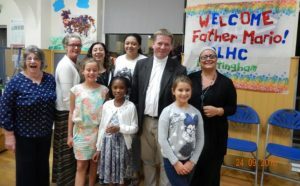 Since his arrival, Father Mario’s ministry has grown from St Patrick’s and neighbouring parishes in the Bromley Deanery, to his additional appointment as Parochial Administrator for Our Lady Help of Christians Mottingham in the Greenwich Deanery. He takes the place of Father John O’Callaghan who retired in August 2016. Father Mario’s experience in education bears fruit here on British soil in his increasing involvement and work with the youth. He is chaplain to St. Vincent’s Catholic Primary School in Mottingham and helps on occasions at Christ the King Sixth Form College in Sidcup. We wish Father Mario a fruitful ministry at both OLHC and St. Patrick’s parishes (visit www.stpatrickschislehurst.org for more information). If you are new to parish, please download census form and return to parish. Thank you. If you are interested in hiring Maryfield Hall, please get familiar with information and agreement documents which we make available for download here. Thank you. 1889 – Father Von Ursbach said the first Mass in Mottingham in a military school he ran in Mottingham Lane with its chapel dedicated to Our Lady Help of Christians. Until 1926 – Mass was said by priests from Christ Church, Eltham, at an orphanage for small boys run by the Sisters of Charity of St Vincent de Paul in Mottingham. 1927 – Start of a Mission in Mottingham – Mass was said on Sundays and Holy Days in a small black hut rented from the Porcupine Hotel by the Christ Church Priory in Eltham. 1930 – The Diocese took over the care of Mottingham. 1933 – The church of Our Lady Help of Christians was built at its present site on Mottingham Road. 9th May 1952 – The church of Our Lady Help of Christians was consecrated by Bishop Cowderoy with Father Porter as Parish Priest. 1953 – The Presbytery was built with Father Porter and two curates as its first residents. 1953 – St Vincent’s Primary School was built in Harting Road with Miss Rose Kennedy as its first Head Teacher. 1956 – The first ordinations took place at OLHC: Father Peter Harris, Father Brian Atkinson, Father Farrow and Father Nixon. 1960 – Father Porter passed away; Father Peter Tak was appointed Parish Priest. 1965 – Father Tak left Mottingham; Father (later Canon) Desmond was appointed Parish Priest. 1967 – Sunday Masses started for parishioners in New Eltham, first held at Bridgeman Hall. 31st January 1969 – Bishop Cowderoy consecrated the new high altar, sealing the relics of martyrs Saints Felicis and Virginia. Bishop Cowderoy also blessed the newly built Maryfield Hall. 1969 – A Mass centre opened at All Saints Church, Bercta Road for Vigil Mass on Saturday evenings. 1972 – Father Eric Nimmo was ordained at OLHC. 1972 – OLHC parish became a member of the ecumenical Association of Mottingham Churches, presently known as Churches Together in Mottingham. 1985 – Anthony Ward was ordained as one of the first Deacons serving Mottingham Parish. 1989 – Canon Desmond passed away; Father Derek Vidler was appointed Parish Priest. 1994 – Father Vidler retired; Father John O’Callaghan was appointed Parish Priest. 2009 – The church’s new entrance porch was opened, providing disabled access and a toilet for the disabled. 2014 – Father John O’Callaghan celebrated his 50 years as ordained priest. July 2016 – Father John’s retirement was announced after 22 years serving as Parish Priest of OLHC. Father Marian Nycz – known as Father Mario – was appointed Parochial Administrator for OLHC. The Mass centre at All Saints Church in New Eltham was closed. 28th August 2016 – A Thanksgiving Mass was concelebrated for Father John’s retirement by Bishop Pat Lynch, Father Richard Plunkett and Father Mario. Bishop Pat blessed the newly installed stained glass windows of Saint Anthony and Saint Jude, and the new vestments acquired by Father Mario. 24th September 2016 – Father Mario was formally installed as Parochial Administrator of OLHC Parish.